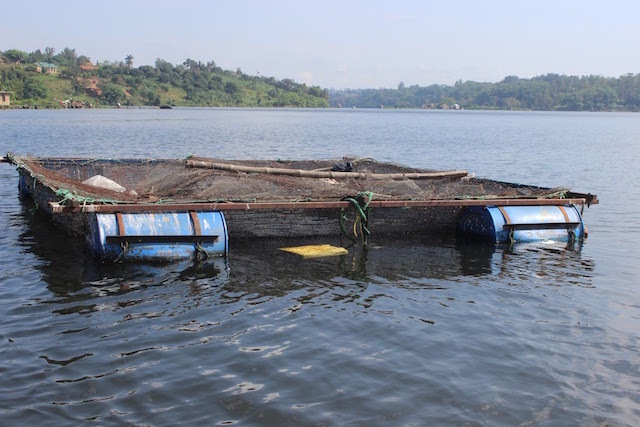 JINJA, Uganda, Nov 12 2018 (IPS) - Colvince Mubiru had heard about cage fish farming on Uganda’s lakes. 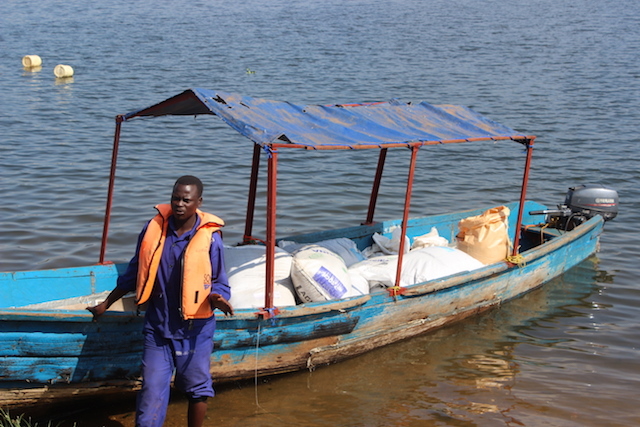 The small business owner decided to try his hand at it and spent USD8,000 to set up farming cages for Nile Tilapia on Lake Victoria, expecting to reap a huge profit. But just six months into his enterprise, he made huge losses. “It was too costly to manage so I could not continue because I could have lost all I had,” Mubiru tells IPS. Both Uganda and neighbouring Kenya have introduced cage fish farming as a sustainable method of ensuring a steady supply of fish stock from Lake Victoria. Uganda began promoting cage fish farming in 2006. Cage culture encloses the fish in a cage or basket made up of floats, anchors and a frame, submerged to a depth of 10 metres. In Uganda, small tilapia of no less than one gram are stocked in nursery cages at a density of 1,000 – 2,500 fish. These are reared to at least 15 grams in eight weeks, graded, and stocked in production cages and then reared for a further six to seven months to reach a weight of 350-600 grams before they are harvested. Fifty-two-year-old Joseph Okeny first became a fisherman on Lake Victoria in 1997. But he abandoned wild fishing two years ago at a time when illegal fishing methods were rife and fish were scarce in Lake Victoria. He has since started a boat cruising business instead. “You could stay on the lake for almost the entire day but could not get enough fish for consumption at home and for sale,” Okeny tells IPS. But things have changed since Okeny stopped fishing for a living. According to the Status of Fish Stocks in Lake Victoria 2017, released in December by the NaFIRRI of Uganda, the Marine and Fisheries Research Institute (KMFRI) of Kenya and the Tanzania Fisheries Research Institute (TAFIRI), fish stocks in the lake have recovered by 30 percent compared to 2016 figures. This also included the stock of Nile perch, a fish not native to the lake, which was introduced in the 1960s. The increase in stock is noted also in a study by the Makerere University-based Economic Policy Research Centre (EPRC), which said aquaculture fish production in Uganda alone increased from approximately 10,000 MT per annum in 2005 to approximately 100,000 MT per annum in 2013 – accounting for around 20 percent of the total national fish production in Uganda. The study said 899 tonnes of fish were being produced in Uganda from cages in every six- to eight-month production cycle. It also stated that there were 28 registered cage culture farmers in Uganda, with a total of 2,135 cages around Lake Victoria alone. However, KMFRI reported last month that this figure is now close to 3,696. IPS travelled to Uganda’s Jinja district area on Lake Victoria and discovered that six cage fish farms are owned by foreign investors. The largest of the six sells fish retail to residents around Bugungu where it has established several nursery ponds. It exports the rest to Kenya, DRC and Europe. Asked why there were no local fish farmers with established cages on the lake, Okeny believes that adopting that technology requires financing that locals cannot afford. Aside from the cost of the cage, which can start at USD 350, seed or fingerlings, depending on the size, can cost about USD 270, according to Uganda’s National Fisheries Resources Research Institute (NaFIRRI). There is also the added cost of feed for the fish. Dr. Richard Ogutu-Ohwayo, a Fish Biology and Ecology specialist with NaFIRRI, has worked in Uganda’s fisheries research for over 40 years, and agrees with Okeny about the cost. “Cage fish farming is extremely expensive and you are keeping fish in a small area. If you don’t look after them very well, it is not only the environment which is going to lose, but you are also going to lose,” Ogutu-Ohwayo tells IPS. “It is not cheap when compared to farming in ponds. And that is why cage fish farming must be practiced as a business just like you rear broiler chicken,” says Ogutu-Ohwayo. Pointing to an abandoned cage floating within the area allocated to fish cages of an international company, Okeny says some locals tried to invest in cages but got their fingers burnt. “They thought that cage fish farming brings money and they also started fish farming without having enough capital to buy feed,” explains Okeny. “These people started without consulting those who have experience. So they failed and most of them withdrew from the business. So that is why you see only one cage remaining,” says Okeny. Researchers of the survey “Prospects of Cage Fish Farming in South Western Uganda” published in June suggest that lack of funds is the main constraint in cage aquaculture and not lack of feed and fingerlings, as has been suggested in other studies in Sub-Saharan Africa. Gerald Kwikirizaa, one of those involved in the survey, told IPS that the results suggested that lack of funds to purchase inputs was the main constraint in cage aquaculture in South Western Uganda. He suggested that the government could boost cage fish farming through subsidising feed cost for small-holders, especially if quality floating feed is produced locally. Fishery development is one of the key global development goals in Agenda 2030, which comprises the Sustainable Development Goals (SDG), with countries seeking to support the restoration of fish stocks to improve safe and diversified healthy diets. Ending hunger, securing food supplies and promoting good health and sustainable fisheries are among the topics to be discussed at the first global Sustainable Blue Economy Conference being held in Nairobi, Kenya from Nov. 26 to 28. Over 7,000 participants from 150 countries will be discussing, among other things, how to build safe and resilient communities and to ensure healthy and productive waters. According to Ogutu-Ohwaayo, cage fish farming is common in the Great Lakes of North America. He said Africa should utilise its inland waters to produce more fish instead of relying on declining wild fish populations. He added that if properly and systematically developed, it can be another means of food production, explaining that 21 percent of Uganda is made up of fresh water, meaning land for food production is scarce. “So we must use our water to produce food. And cage fish farming is one way of using our waters, in addition to other services, to actually produce food,” Ogutu-Ohwayo further explains. He said Uganda’s population, which is growing at over three percent a year, cannot survive only on wild fishing, which has stagnated. Ogutu-Ohwayo said aquaculture is the fastest growing food industry in the world and provides an option for meeting the deficit in fish production. Uganda’s fisheries production for capture fisheries and aquaculture is estimated at 400,000 tons per year, which is not sufficient to meet growing demand. The six kg per capita fish consumption is far below the FAO-WHO recommended level of 17.5 kg. “My conviction is that Africa should not be left behind in cage fish farming. And we have the capacity not to be left behind if we do it well,” said Ogutu-Ohwayo, also a board member of the International Association for Great Lakes Research (IAGLR), a scientific organisation made up of researchers studying the Laurentian Great Lakes, other large lakes of the world, and their watersheds. There have been regional efforts to address the declining fish stocks through innovative technologies. “You must follow best management practices. Just like you would manage a zero-grazing cow. You must put in adequate management. We as scientists are doing our best to develop these best management practices,” says Ogutu-Ohwayo. A project known as Promoting Environmentally, Economically and Socially Sustainable Cage Aquaculture on the African Great Lakes (PESCA) is part of the efforts to address social and environmental concerns related to cage culture. It operates in Uganda, Kenya, Tanzania, Zimbabwe, Malawi and generally in the African Great Lakes. PESCA has been operational since the beginning of June 2018. “There have been concerns that cage fish farming is going to spoil the quality of the water. We want to develop tools that would promote cage fish farming in an environmentally and social way,” said Ogutu-Ohwayo. He has seen the negative and positive aspects of cage fishing farming. “I think cage fish farming is very productive going by the amount of fish harvested by [a cage fishing company] fish. 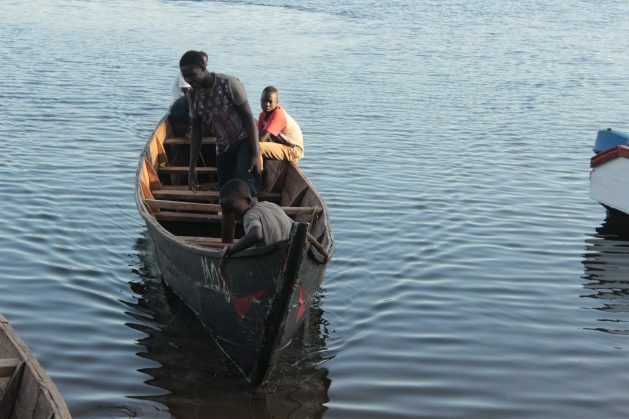 And because of that, they are paying their workers very well,” Okeny tells IPS as he docks his boat after a busy day.